All of our worship services have a message preached by one of Good Shepherd’s four ordained clergy. 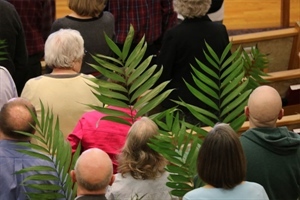 The sermons are engaging and relevant for those seeking to grow deeper in their life of faith. Sermons are centered on Scripture and help to connect God’s story to our own. Holy Communion is celebrated at every service on the First and Third weekends of the month and on all major festivals. It is celebrated at all 5:00 p.m. Saturday evening services. All baptized believers in Jesus Christ are welcome to commune. Listen to recent sermons here online. This is a casual service that weaves music from a variety of traditions into an upbeat order of worship. Music is led mostly from the piano and includes contemporary as well as traditional songs. The center of this worship is Holy Communion, which is celebrated every Saturday. 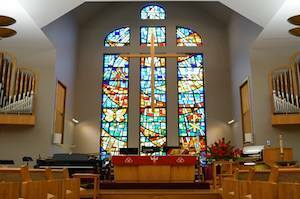 The casual feel of this service provides a great atmosphere for visitors to get a sense of the congregation. It is also a great alternative when you are not able to worship on Sunday mornings. The average attendance is 40-60 people. This is our most intimate service and follows a traditional liturgy. Primary musical accompaniment is provided by our amazing pipe organ. Good Shepherd's accomplished hand bell choir also plays at this service once a month. The 8:00 am time is a favorite among early risers, and people who like to have the rest of their Sunday available for rest and family time. Holy Communion is celebrated on the first and third Sundays as well as Festival days. Attendance averages between 20-30 people. The Family Worship Service (FWS) is a 30-minute worship experience designed for children grade 3 and under, and their families. At Family Worship, children help make worship happen! A simple message geared for youngsters teaches them (and their parents!) about God's great love and what it means for our lives. Easy, child-friendly songs are standard fare. 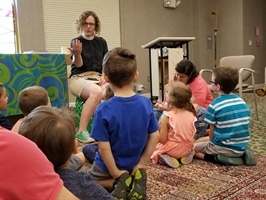 Children are encouraged to serve as ushers, acolytes and communion assistants (communion is celebrated on the first and third Sundays) in order to help them learn about worship and discover how valued they are by God and the church. There are typically 30-55 kids and adults at this energetic service. While children are always welcome at ALL services, FWS seeks to meet the worship/developmental needs of young people and their families. FWS is held in fellowship hall, near the main entrance to the church. Just follow the joyful sounds of laughter to find it! A variety of contemporary music is led by a Praise Team (vocalists) and a Praise Band that consists of piano, drums and guitars. There is a rich variety of congregational singing as well as songs led by small ensembles. 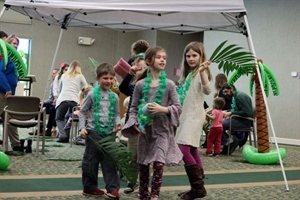 An average attendance of 175-225 people of all ages helps give this service a lot of energy. The order of worship is projected on a screen to allow fuller participation by worshippers. (Printed bulletins are available, however, for those who prefer them.) Communion is celebrated on the first and third and festival Sundays. This service may find you clapping your hands or tapping your toes! Folks of all ages (parents, kids, tweens, aunts and uncles) gather under the indoor tent in the Fellowship Hall on Sunday mornings (Sept-May) at 10:40 a.m. for a 50-minute blend of worship and education that is active, hands-on and equips you to live faithfully in the world each week. Just like Manna physically sustained the ancient Israelites and constantly demonstrated God’s love and provision for them, Manna at GSLC strengthens our confidence in God each week and shows us where our place is in God’s story of salvation. 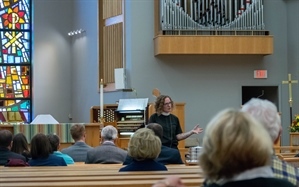 This service follows a rich and engaging liturgical format. 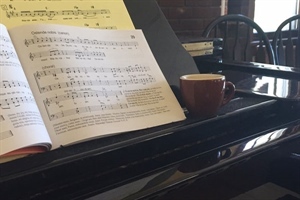 Traditional hymns and other sacred music are the norm and are led from our amazing pipe organ, although familiar modern music is also incorporated into the service from time to time. 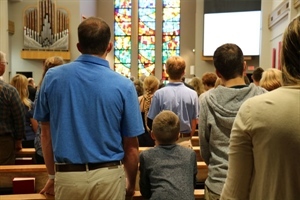 The 100-125 people of all ages who worship at this service find it to be an uplifting experience that helps them enter into God's presence through time-honored liturgy. Musical leadership is provided by the Chancel Choir and the bell choir. Brass and other instruments enhance our worship on Festival days. Communion is celebrated on the first and third and festival Sundays. When Jesus and his disciples celebrated the Last Supper, most of them weren’t aware that it was the last supper—it was just a supper. It was very likely to have been another in a long line of communal meals, time for the inner circle to unwind, debrief, pray, and enjoy one another. When Jesus said, “Take and eat, do this in remembrance of me,” it’s very possible that he meant, “Whenever you eat together, remember me.” That is, whenever you share a meal—Sunday or not, in church or not—remember Jesus and what he said and did. Thus, our weekly worship at the Edge is embedded within our weekly dinner. We will read and discuss scripture, pray, sing, and share the Body and Blood of Christ, all while enjoying one another’s company and home-made food.